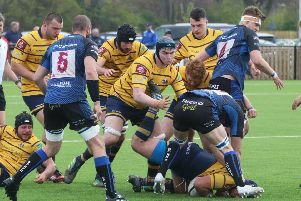 Worthing Raiders recorded their third National 2 South win of the season with a thrilling 51-37 victory over Birmingham & Solihull on Saturday. In total, 13 tries were scored in the match, with Raiders touching down three late tries to secure the win. Worthing sit sixth in the table, four points behind leaders Rams after five matches. Click on the video above to view Stephen Goodger's pictures from Saturday's match.